Sarah Bourque has been a freelance writer since 2006 and is based in the Pacific Northwest. She writes and edits for the local publisher, Pacific Crest Imprint and has written for several online content sites. Her work recently appeared in "The Goldendale Tourism and Economic Development Magazine" and "Sail the Gorge!" magazine. She attended Portland Community College where she studied psychology. Add the water or broth to the large baking pan. Place the turkey drumsticks in the pan, not touching each other. Cover the pan tightly with aluminum foil. Place the drumsticks in the oven and bake them for 2 hours. Turn them over halfway through the cooking process, ensuring that you cover them tightly again after turning. They are ready to eat when the meat is tender and falling off the bone, and they've reached an internal temperature of 155 degrees Fahrenheit. Remove the drumsticks from the oven and serve them hot. 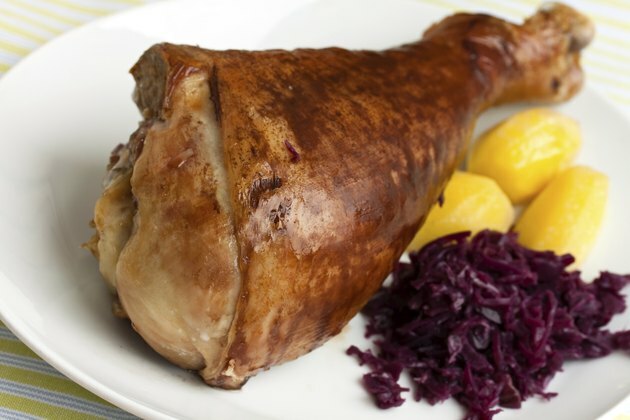 Smoked turkey legs are a healthier choice than fatty pork products such as ham hocks or salt pork. Use smoked turkey legs as a substitute for dishes like collard greens and beans. Serve whole smoked turkey legs with a green salad and brown rice for a complete meal. The same instructions can be used to reheat other types of precooked turkey legs. According to the FDA Office of Women’s Health, pre-packaged meats such as smoked turkey legs should be reheated until smoking hot to avoid getting sick from a germ called Listeria.